Have you seen the Notably Ornate stamp set on page 65 of the Idea Book and Catalogue? It contains four stamps all of which are extremely useful: the 'take note' stamp can be cut out with the large oval punch; and the 'just because' stamp is an ornate box that can hold other sentiments using a marker and a stamp-a-majig. But my favourites are the beautiful frame image and the bird in flight. The focal panel is simply stamped in four different blues to look as if a flock of swallows has just flown in. I mounted it onto a darker, stamped card base to emphasise its lightness and added an airy Organza ribbon. I didn't add a sentiment because it would have interfered with the birds, but it could always be added inside the card. Cut an 8.5cm square of Whisper White card stock. Stamp a design of birds using Baja Breeze, Pacific Point, Not Quite Navy and Night of Navy inks. Sponge the card stock lightly with Bashful Blue ink. Add eyes to the birds with a Night of Navy marker. Tie a piece of Organza ribbon round a 9cm square of Night of Navy card stock and finish in a bow. Glue the stamped panel onto this. Cut a 21cm x 10.5cm piece of Marina Mist card stock. Score and fold in half to make a card base. Stamp the front with the Bella Toile background stamp. Attach the stamped panel to the card front using dimensionals. Here's another card made with a similar design - a one-layer card this time. This time I did add a sentiment. Do you recognise it? Yes it's from a free sale-a-bration set! Sadly, this promotion has now finished but you can still grab a bargain in the March Frenzy sale - where selected products have up to 30% off! Click here for details. I wrapped a little present in copier paper, stamped to match the card, and tied it up with Real Red 1/4" grosgrain ribbon. The tag is simply a bird stamped onto Whisper White card stock, cut out with sharp paper snips and tied onto the gift with linen thread. 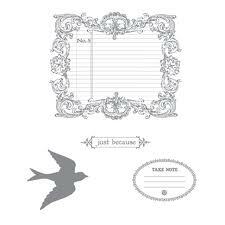 What a versatile image that bird stamp is! You've certainly not seen the last of Notably Ornate on my blog - I love it! As always, if you'd like to see other cards I've made with this - or with any set I use, just check out the index on my side bar. And if you have any questions or would like to make an order with me, do drop me an email or give me a ring on 01280 820593. Thank you for visiting my blog today and I hope you have a lovely day! 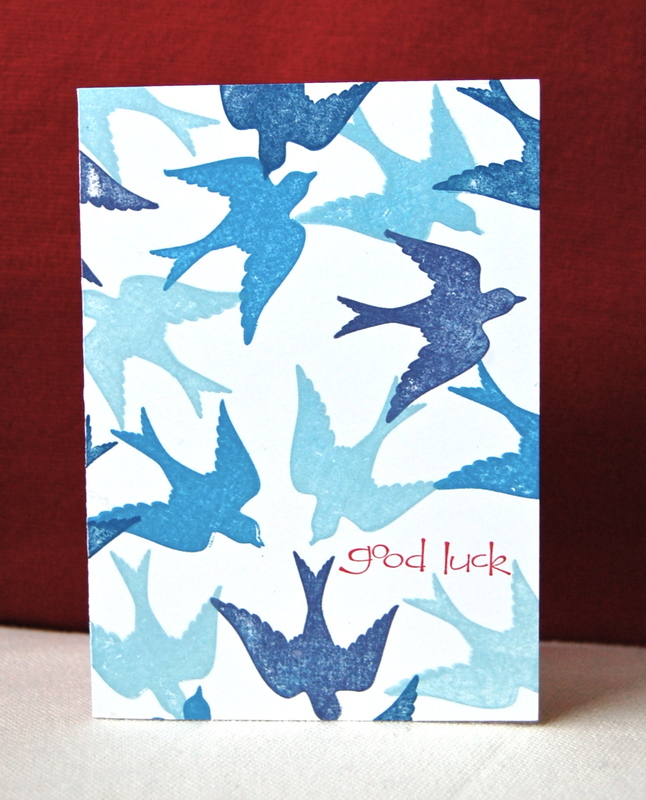 I have lots of wedding cards to make this week - may use the birdy! Love how you made such a modern design from such a "not modern" set! You are amazing! Frames are one of my favourite types of images. I love how you used this one! Those birds in all the different blues look amazing!! Lovely cards Vicky - where DO you get all your ideas from???? These cards remind me a bit of Richard Bach´s book Jonathan the Seagull (which I totally loved). As I am from the coast I am totally fond of these cards!